Parents, grandparents, caregivers, and apparently ballet teachers are no strangers to temper tantrums. This was made quite clear in a heart-warming video of a dancing daddy that was since gone viral! If there’s anything more charming than a two-year-old girl doing ballet, it’s her daddy copying the combination of pirouettes and plies. It all started on May 29 when father-of-three Marc Daniels was at his two-year-old daughter Bella’s dress rehearsal in Bermuda. Now, if you’re a parent, no matter how much you want your child to “just have fun,” chances are you don’t want to be the parent whose child messes up the show. Bella suffered a bout of stage fright and was having none of it! She plopped herself down on the ground, was screaming and crying, and wouldn’t participate in any of the dancing – until her daddy came to save the day! In the video recording below, you can see her father surprise Bella on stage while holding his youngest daughter. Immediately he starts mimicking the dance instructors moves. Slowly but surely, Bella started participating again. It’s beautiful how such a small gesture can have such a huge impact, whether or not we see its significance. How many parents (let alone dads) would get that involved? Daniels humbly said, “I’ve practiced with them at home on many occasions so it wasn’t unfamiliar to me.” But it’s important not to downplay what his loving actions mean to his two-year-old girl. Not only did Bella probably have a successful dance recital, but she has an even stronger relationship with her father. One thing is for sure – although the world knows Marc Daniels as the toe-pointing father, Bella knows her daddy even more now as a source of love and protection. 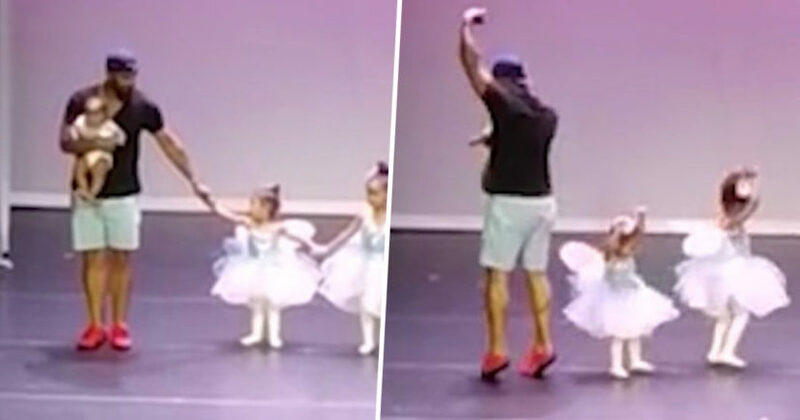 The post Dad Does Ballet With His Daughter After She Suffers Stage Fright appeared first on The Hearty Soul.